Manners closes, but what will open? If you have read the Dominion Post article on Manners, you will know that the plans to un-mall Manners Mall have just been passed. If you have read the Dominion Post article, you will also not know the full story. Whether due to the breaking nature of the announcement, or somewhat slanted journalistic intent, the dom doesn’t make mention of the news that the lower end of Cuba St down to Wakefield will be redeveloped as a pedestrian-oriented public space. For this reason, I don’t see why the utility that Manners provides cannot simply be transplanted to the newly developed area of Cuba St, as the council has decided. Alarm bells sound when it is mentioned that�this new space will be ‘shared’ and not completely pedestrianised, however there are many precedents for such spaces being�successful,�so I will welcome the experiment. Moreover,�it is entirely possible that Manners Mall can be re-purposed as a similar ‘shared street’. As a bus-only lane, the traffic presence would be relatively low, especially during the off-peak times. Manners’ place in the urban fabric of Wellington means it must be able to cope with large volumes of pedestrian traffic, but the addition of a bus lane is not necessarily a significant impediment to this. As with the lower Cuba development, this task will rest on the capabilities of the selected designers. New and improved pedestrian areas in Dixon, Wakefield, Mercer and Willis streets have also been approved over the next five years. Councillors also agreed today to extend the 30kph speed limit (already in place in Lambton Quay and lower Willis Street) to Courtenay Place and Manners Street; to put traffic lights on the three pedestrian crossings in Courtenay Place; and ban the right turn from Victoria Street into Manners Street. 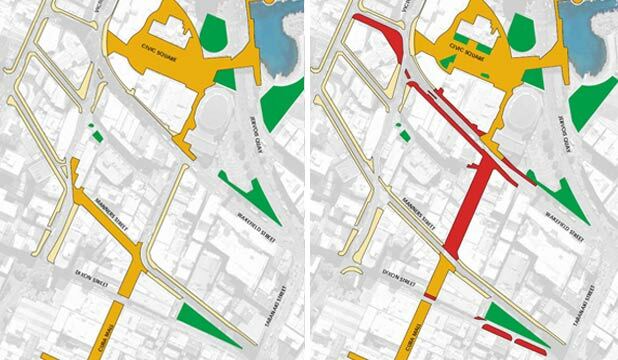 About 40 additional on-street car parks are planned. Can the function of Manners Mall as a public space be effectively relocated to lower Cuba? Was Manners Mall a successful space in the first instance? Should lower Cuba (and perhaps Dixon) be pedestrianised, and how? Should they be Cuba St’s? Courtenay Place Parks? Midland Parks? Lambton Quays? Something completely different? Updated 11 June: with plans from the Wellingtonian. On the left, as it is, and on the right, as it is proposed. just make the whole of courtney, manners, willis and lambton pedestrial. send the buses one block behind the pedestrian streets. I am really surprised that the Council voted to go down this route (so to speak), especially as we are in the middle of a recession, and the works will cost $11million and only save 3 seconds. Brave move? or Incredibly Stupid Move? Depends on the angle you view it from. But I am also quietly hopeful that the Council have taken on some of the feedback sent in so far. The DomPost article says that Public Consultation has not yet been undertaken. Not the way I remember it. They’ve already called for submissions some months ago, and had a fair whack of feedback, quite possibly most of it negative, including the FaceBook campaign. They’d better be well prepared for a massive amount of anti – Mall – deletion – feedback that is bound to be coming back their way. Mayor Prendergast. Balls of Steel. Flies in the face of Public Opinion. Wonderwoman indeed…. I’m really anxious about losing public/pedestrianized space in the city, but I have not the tiniest affection for Manners Mall. Not that the lower Cuba option stands to be much better without massive redevelopment of that chunk of dead street – but still, let these changes come! peter: thats hopefully the plan, albeit a very long-term one. maximus: 3seconds and $11million seems slightly pessimistic. 3 minutes is the number I had heard floated, and the $11million is for public transport upgrades along the entirety of the golden mile, certainly not just Manners. This is a great idea and I’m certainly in favour. The improvement to bus flow across town has got to be a good thing and Manners Mall is one of the worst public spaces in this part of the city, second only to Glover Park which was such a waste of money. Those $$$ should have been used to swap the land for the car park nearby on upper Cuba St. so that Floriditas and Duke Carvels could open up onto a safe, sunny, green space. One day maybe? You’re right about Glover Park and the Cuba St/Swan Ln carpark. Last I heard, the owner of the Swan Ln car park wouldn’t sell, despite all offers. commentYour right about the Swan Lane/Glover Park swap. The best thing? Certainly, but not possible if the owners wont sell. Well unless you rewrite the Public Works Act…. – its by an architect called Ken Davis – so presumably Herriot Melhuish are doing the plans? “Cars may be restricted to 5kmh on parts of Wellington’s Cuba St under council plans to put bus lanes through Manners Mall. 5km speed limit. Which begs the question – why allow cars at all? Sure – goods vehicles, couriers, perhaps even taxis. But I can’t see who would really need (or rather, want) to travel down this route at a snails pace. Oh, yes I can – try-hards in their souped-up jap import car with the stereo booming. Great. I am completely in favour of this. The Council did a poor job of selling the idea to the public, and some Council officers have admitted as much. I am a little more skeptical about the pedestrianisation of lower Cuba, but that is mostly because I used to live on lower Cuba and, while I live on a pedestrian mall now, do not like the idea of living on a pedestrian mall. Thinking about it, though, it is actually quite a logical thing to do – linking Ghuznee Street to the waterfront and Chew’s Lane, effectively. Also, with any luck, it will encourage development of what I believe has the potential to be the best little street in the city, Bond Street from Cuba to Victoria. It makes Civic Square and the Town Hall a destination, and makes the whole Civic area more accessible. It should also encourage development of the Michael Fowler car park. I still can’t work out from the plans and statements and etc. what’s going to happen to Dixon Street though. I’m in favour of pedestrianising Lower Cuba, altho at the moment it isn’t a stree with anything going for it. Certainly no shops or eating establishments that I ever stop at. But I can’t see why you’d want to allow cars through, even at walking pace. It is a route between Wakefield and Manners Streets. At the Manners end, it intersects with the new bus-only section of Manners, and the pedestrian-only section of Cuba. That means that its ONLY use for vehicles is a way in and out of one small section of Manners Street. Taranaki Street is only a couple of hundred meters further along and allows exactly the same access. The answer is simply for car parking. But for the car parks on Manners St and Cuba St it wouldn’t need to be open. They don’t feel up to saying the bus route will be bus-only, and the car parks will be removed. Shame, because I think it makes it less viable, and the bus-only route has to come eventually, so what happens to lower cuba at that time? No more through traffic it must be turned into a cul-de-sac for car parking. So is that an expensive future rebuild of the mall or is it planned for somehow? or is it just that they need to get vehicles through for servicing? where do these guys offload their vans at present? For Burger King anyway, they frequently seem to park a semi-trailer in the Mall each morning to offload their burgers for the burghers. At the very least, that’ll have to move out of the buslane and into the lower Cuba Mall…. I’m cautiously optimistic about this — I would love to see more shared spaces in Wellington, I just hope they’re done right. If done right it could be fantastic, let’s just hope that they don’t “conveniently” run out of money after phase one of the plan (putting a bus lane through Manners). The 5km/h is a technicality I think. The famous dutch “woonerf”, a residential area where pedestrians and cyclists (and playing children) have priority over cars, the speed limit for cars is 5km/h, but legally this means “at walking pace” – court cases in Europe have shown that this *could* (depending on circumstance) be anything up to 15km/h if I remember correctly. Grrrrrt, tell us more. I’ve long been a fan of the Dutch way of having pedestrians and cyclists take precedence over car drivers – and sensible planning of roading to include cycle priority to the Nth degree. New Zealand traditionally does this very poorly – mainly, I suspect, because we don’t have any dutch roading engineers on the councils and Transit. What is noticeable in the Netherlands is that virtually nobody wears a cycle helmet over there, yet (in the older traditional centres of den Haag, Amsterdam, Delft etc anyway) there is a very low incidence of cycle accidents. I’ve heard that is because under Dutch law, in an accident between a car and a cyclist, the car driver is always held responsible. Is that correct? Maximus: Dutch traffic laws offer extra protection to “vulnerable” traffic participants, such as cyclists and pedestrians. As far as I know, it used to be the case that motorists would (almost) always be responsible in an accident with cyclists or pedestrians, but I think this has changed somewhat. However, the vulnerable position of cyclists is still recognised in that even when cyclists make “minor” misjudgements in traffic they would not be held responsible, because it is deemed impossible for cyclists to have perfect judgement at all times. I’m not a lawyer, so the above could be incorrect. What I do know is that dutch roading layout keeps cyclists and cars/buses/trucks out of eachothers’ way where speed difference or traffic density is a factor, but most importantly (I think): Dutch motorists are *much* more aware of cyclists and pedestrians. This awareness is hammered into your brain when you take (compulsory) driving lessons. This awareness is probably also greatly improved because so many people are cycling. There’s just no way you can “forget” about cyclists, because they are everywhere. Finally, almost all dutch drivers are also cyclists, so they know what it’s like to be in traffic on a bicycle. Late again, but did anyone see the article about Auckland trying for the shared pedestrian/car spaces (lower Shortland Street and some others..)? They have just got approval, and I think this would be appropriate for lower cuba. I also think this is what Waring Taylor, Johnston, Brandon should be like. Tables and chairs and big tiles and people walking everywhere and taxis meandering through. Just make sure your kids are holding your hand. here’s an editorial, not the actual article.